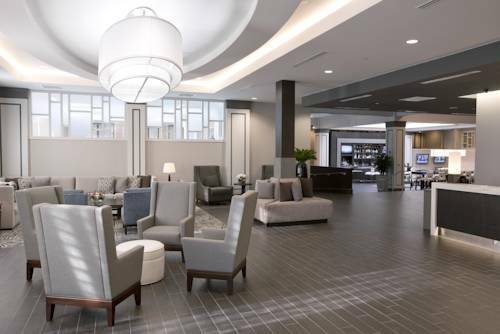 Greenville Hotel with Boutique Feel Near Downtown and GSP Airport Welcome to the Crowne Plaza Greenville I-385 Roper Mtn Rd near I-85. We are 8 miles from the Greenville Spartanburg airport GSP, minutes from downtown Greenville. Get about swiftly with our complimentary airport transfer and local shuttle for a 5-mile radius. Are you and your family in town to experience a show at the Bon Secours Wellness Arena or The Peace Center? Looking for great shopping at The Shops at Greenridge, Haywood Mall, Pelham or Woodruff Roads? Are you a corporate traveler visiting a local manufacturing facility or the Greenville Convention Center? No matter what brings you to here, we are central to it all and offer amazing amenities to customize your stay. Relax in our indoor heated saltwater pool, visit The Marketplace for local treats, and enjoy all-day dining or room service. Business Travelers will love our Crowne Plaza Workspaces including private pods, larger nooks and huddle spots for a great way to work and play. Each spot includes complimentary HDMI hookups and iPad ordering for delivery right to you. Or reserve The Studio, a modern 24hr self-booking meeting room with wireless presentation capability- available to book by the hour. Enjoy 1G of complimentary Wi-Fi, Keurig coffeemakers in each room, and Ruth's Chris Steak House on site. Ruth's Chris Steak House: Our Famous "Signature Steaks" are seared to perfection and topped with fresh butter. They sizzle all the way to your table. Expect amazing food, amazing quality and amazing value!